Super Metroid: Escape from Planet Metroid is my first completed romhack. After landing on the mysterious Planet Metroid, Samus is seperated from her ship, and must find her way back to it so she can escape. 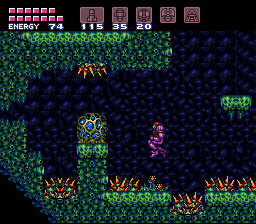 Along the way, there are bosses to kill, items to collect, and spikes to fall into. 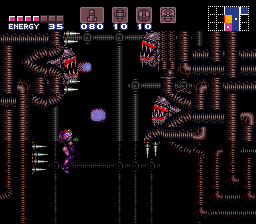 Super Metroid: Escape from Planet Metroid is a minigame, about 1/4 the size of the original. It contains four bosses, most of the major abilities, and a maximum item count of 64. Please give me your feedback after playing, so that I can improve.